Thermo Fisher Scientific has released a software update to its chemical ID software products, FirstDefender RM and FirstDefender RMX, called Thermo Scientific FirstDefender RM/RMX 4.1. With the new software, the all-optical Raman system devices can ID more chemicals, prioritize certain chemicals and more. Users can use tagging to prioritize which unknown chemicals are of the greatest concern to their specific company. 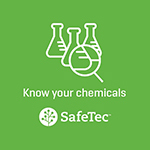 Though users can focus in on specific chemicals, they can also ID over 11,000 different chemicals if need be. The new software also features updated language settings that allow users in countries all over the world to use the program. Air Systems International introduces the Breathing Air Transporter™ (BAT). 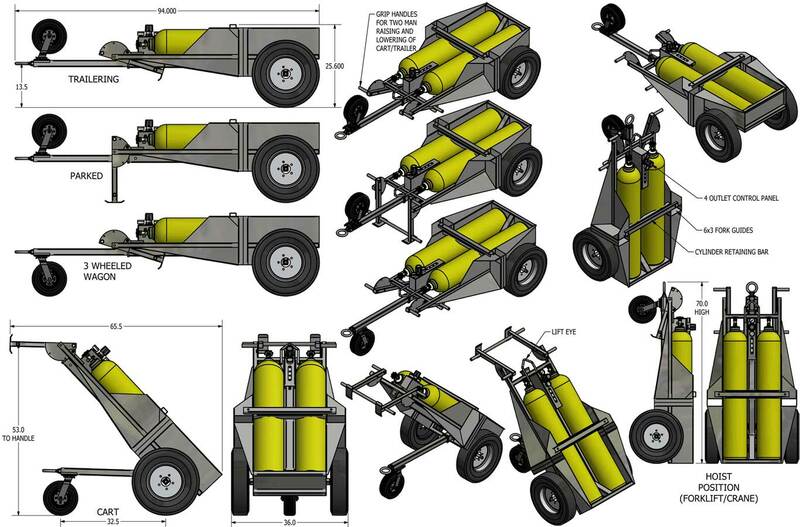 The BAT holds 2 large breathing air cylinders with a 4-outlet breathing air manifold and can be manually pushed, towed with a vehicle, fork lifted or hoisted where breathing air is required. The cart supports the weight of the cylinders and the standing position offers a small storage footprint and makes it easier to exchange cylinders as needed. BAT Configurations Include Trailering (Towing), 3-Wheel Wagon, Upright for Forklift, Hoist or Storage; and 3-Wheel Push-Cart. See the BAT at the 2018 NSC Show, Booth 2953. The Clamp Jacket from PYI, Inc. is a device that is designed to slide over the tail end of a hose clamp. This provides a safe working environment anywhere a hose clamp is installed, which results in less employee downtime by preventing injury in the first place. Made of EPDM rubber, the Clamp Jacket is very durable and holds up well when exposed to grease and oils. Clamp Jackets come in ½” and 5/16” and can withstand temperatures of up to 300 degrees Fahrenheit (steam up to 400 degrees). Clamp Jackets are ribbed on the inside to provide a tighter grip onto the hose clamp and have an extended tail to help align the Clamp Jacket in order to easily slip over the hose clamp tail. Brady’s new durable shadow boards improve workplace organization and reduce non-value-added time by indicating where equipment, tools and janitorial supplies belong with professional-looking graphics. The shadow boards feature protected graphics printed on the back and sealed with a water-resistant coating to withstand frequent tool use, washdowns and temperatures up to 140 degrees F. The transparent, ¼-inch-thick thermoplastic material (polyethylene terephthalate) is laminate-free to avoid peeling and bacteria collection—a concern in many processing environments. LineWise’s Temporary Conductor Support (TCS) holds energized conductors above the crossarms when additional clearance is needed. The TCS is lightweight yet durable and attaches to most sizes of crossbars. Field-tested and approved by transmission and distribution maintenance professionals, LineWise’s TCS features a foam-filled fiberglass rod and aluminum wire holder. At 49.5 inches tall, the TCS consists of 32-inch clear span insulation. It has a vertical load capacity of 300 pounds and a horizontal load capacity of 150 pounds, while weighing only 23.5 pounds itself. WernerCo’s WEATHER GUARD UnderBed Boxes are weather-resistant boxes that are designed for flat beds, heavy-duty trucks and semis. WEATHER GUARD Underbed Boxes keep valuable tools secure and protected from the elements, yet remain easily accessible for maximum productivity. The rugged storage boxes are available in a range of sizes from compact to jumbo, come in both steel and aluminum options, and are backed by a lifetime warranty. Fibergrate Composite Structures has developed a fiberglass reinforced plastic (FRP) solution for the oil/gas industry. 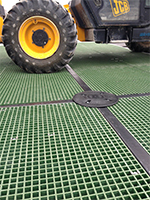 Fibergrate’s modular spill containment system consists of large pans created from a matrix of fiberglass reinforcement embedded in a corrosion resistant resin, then covered with traffic bearing, slip resistant Fibergrate molded grating. The system was designed with durability and mobility in mind and reduces containment concerns, plastic expenses, and trip/slip hazards. The durable system has a uniform, flat surface that is able to withstand the traffic and weight of heavy mobile drilling rigs, frac, and other equipment. The GREEN Access and Fall Protection line by Benko Products announces the Portable Transloading Platform for transloading needs. The platform is ideal for use in the petroleum and crude oil markets and provides a safe mobile access solution for transloading operations, either truck-to-rail or rail-to-truck. The unit can be customized to provide access to two rolling vehicles simultaneously and when in use, the operator lowers the gangway and is protected from falls for safe access to the top of the vehicle. Summit Training Source Inc.'s "Manual Material Handling Safety" program is designed to train employees on the best safety practices to use while lifting, moving, and storing materials. This includes proper lifting techniques that can help to significantly reduce the amount of strain on workers' backs and decrease the risk of injury.